“Ravena, Winter Chic”—a new DOLLS exclusive by Ruby Red Galleria, hits the street in style! A New York City native, the harsh NYC winters don’t stop “Ravena, Winter Chic,” a DOLLS dressed doll exclusive by Ruby Red Galleria, from exploring the city she loves. From uptown boutiques and coffee shops to downtown restaurants and theater, “Ravena, Winter Chic” bundles into her purple tights and faux-fur boots, corduroy short pants, pansy T-shirt, black motorcycle-style jacket and cozy knit hat to hit the streets in style. Even when the elements are unforgiving, “Ravena” survives and thrives in the city that never sleeps! The fully dressed 12-inch ball-jointed vinyl doll features removable wig and eyes, plus underwear and a sweet “love” tank top. 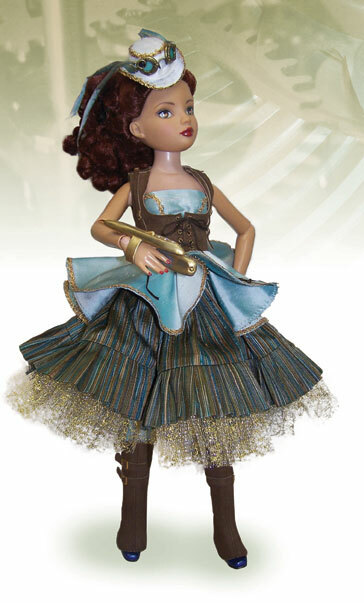 The dressed doll is limited to an edition of 100.